Charlie is going well with the building of the bulkheads. These form both frames and the outline of the interior, and are made up for the most part of 9mm and 12mm plywood webs with 20 mm Fijiian Kauri solid grounds around the edges and where other plywood panels will be fastened to them. 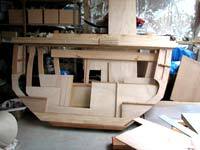 There will be nine bulkheads plus the transom, and at this rate he will be ready to set them up for stringers and planking in about a week and a half. I’m having to get on with drawing the detailed plans to stay ahead of him! The pile of finished frames grows, a new one every couple of days. You can see here the shape of the galley and chart table on B# 5, this bulkhead is about where the aft chainplates are and the plywood webs are in part there to spread the rigging loads. So far he is up to B#7 complete with its 70 x 80mm Kwila (seriously hard, hardwood!) floor timber. There are to be nine bulkheads, numbers one, two and four, seven and eight forming crash dams within the boat to confine leakage to a small part of the boat if something holes the 17mm thick fibreglass covered cold moulded wooden skin. We bought a retired 20 ft shipping container to give me storage room for all the non boatbuilding stuff that was filling up my workshop, and I’m about halfway through moving daughters household, my motorcycle, some surplus furniture and all the other mess into it, and within a few days we will be able to move again. My big bandsaw is causing some grief, the guides on this 20in 280kg monster are about had their day, it’s a Chinese made one, same as is sold under the “Grizzly” brand in the USA and while they are good value for the price and appropriate for someone like me who might put a couple of hours running time on it per week they are not very sophisticated and I’ll have to get some new guides made before we break too many saw blades. 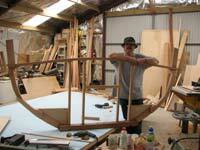 Charles Whipple, boatbuilder, author, adventurer. The frame is B#7, the one across the aft end of the main cabin, you can see the uprights that outline the engine bay, wet locker ( starboard side) and battery box and tool locker ( port side) and the shape of the quarter berths each side of those. Our suppliers have been both interested and helpful. Gordon at Plywood and Marine Supplies has been doing us a good deal on plywood and WEST System epoxy. He’s at 8F Vega Place Mairangi Bay Industrial Estate, North Shore City Phone 07 478 5600 . Tell him I said that he would look after you, he’ll laugh, tell you he’ll sort me out next time he sees me and you’ll get good product at a good price. He freights to anywhere in NZ by the way and is well worth getting a quote from! Fijiian Kauri. Agathis Australis, a close relative to the legendary New Zealand kauri and a very good medium light softwood boatbuilding timber. Glues and fastens well, shapes and finishes very easily. or Moluccan Ironwood among other names. Hard, really hard!!!. Heavy, dense, very stable and durable, works moderately well but can blunt tools very quickly. Back next week with another progress report. In the meantime, back to the drawing board, John Welsford. Designer, solver of puzzles, sharpener of tools and maker of cups of tea.